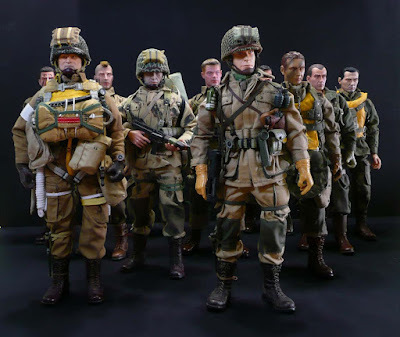 The Normandy Landings were the first operations of the Allied invasion of Normandy, also known as Operation Neptune and Operation Overlord, during World War II. 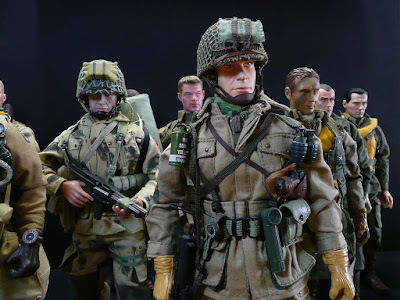 The assault was to be conducted in two phases: an air assault landing of American, British and Canadian airborne troops shortly after midnight, and an amphibious landing of Allied infantry and armoured divisions on the coast of France commencing at 6:30. 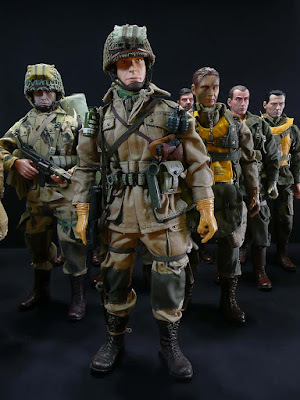 Here are some of my 1/6 scale 12-inch World War II American paratroopers getting ready for their airborne assault over Normandy, some already kitted out while some are just getting ready for the mission ahead. 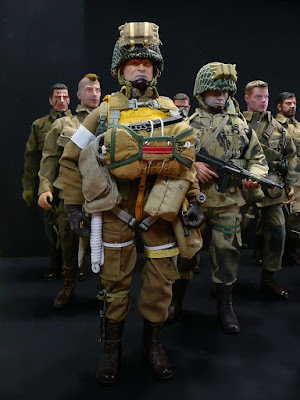 BBI Figuretoy.com exclusive in 2003 - WWII US Army 101st Airborne paratrooper with complete equipment, including a working parachute with rig lines plus the M9A1 rocket launcher with three 3.4lb rockets. Figure shown is out of box but minus all his other accessories. Hope to do a full post one day. 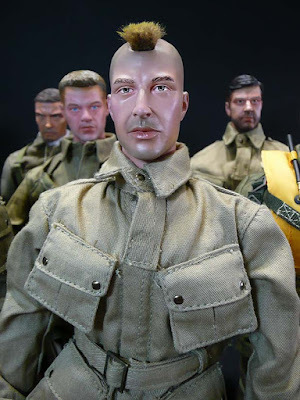 Dragon US 17th Airborne Bar Gunner "Jeb" (also with Nicholas Cage likeness) - click here for more pictures. 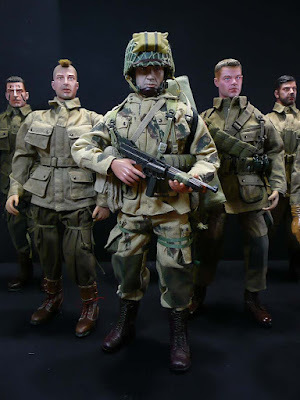 Dragon released this US Army 17th Airborne Division Bar Gunner from Operation Varsity Private "Jeb" as part of its "Road to Victory" series in 2003. Third time's the charm for Dragon as it tried to get Nicholas Cage's head sculpt done right. 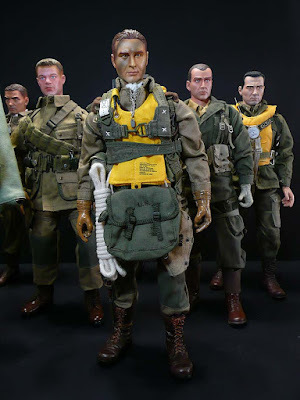 First with SGT Joe Enders, then US 82nd Airborne Pathfinder "Tom" and finally "Jeb". 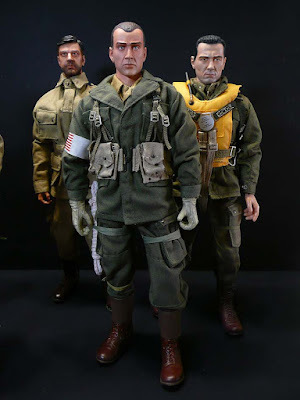 Dragon WWII 101st Airborne Division Officer (1st Lieutenant) "Frank Laird" figure out of box. 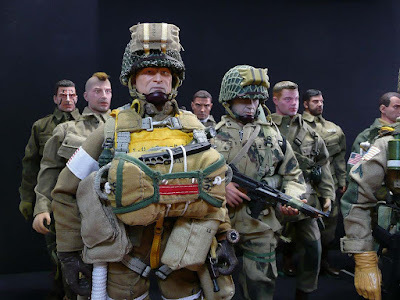 Apart from the historically accurate uniform, this authentic action figure comes with highly detailed equipment including an improved 3rd pattern Griswold bag, M1912 small arms ammunition pouch and T-5 parachute main pack. 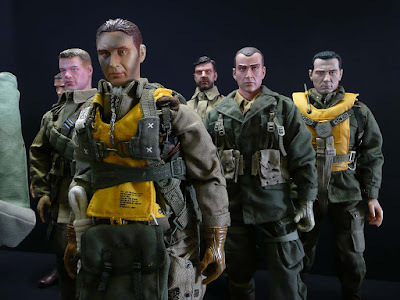 BONUS FEATURE: Each figure includes a true to 1/6 scale door frame of the C-47 transport aircraft! 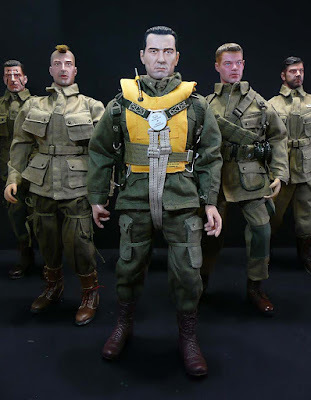 The figure comes in the box poised for his jump at the door frame - very NICE! 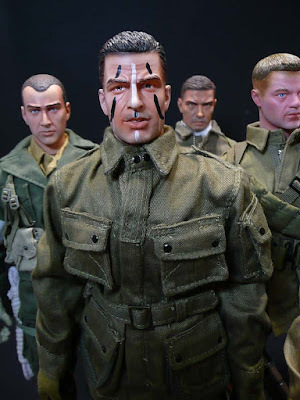 DiD's WWII US 82nd Airborne Division 1/6 scale collectible figure "Sergeant Corbin Black" and WWII 101st Airborne Division "Ricky Foster"
And "Ricky Foster" comes with mohawk hairstyle (an alternate head sculpt was also provided). Many accounts of Native American cultures claim that 'In times of war, Mohawk men shaved their heads except for a scalplock or a crest down the center of their head - the hairstyle known as a roach or a "Mohawk." 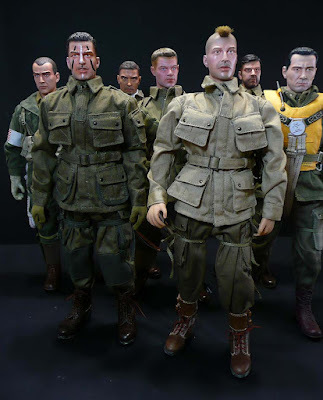 During World War II, members of the Allied Airborne soldiers (specifically the 101st Airborne Division - the "Screaming Eagles") shaved their hair into Mohawks. 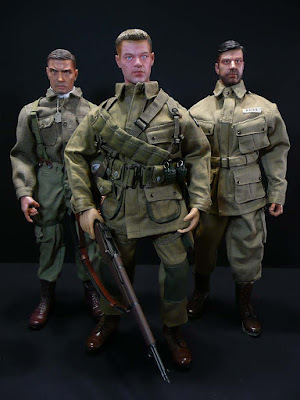 NEXT: June 6, 1944 - D-DAY! Time to buy the Toy Haven Plaza you always wanted! WAH marcus, see me got up :) thanks lah. Toy Haven Plaza sounds mighty NICE - ha! ha!